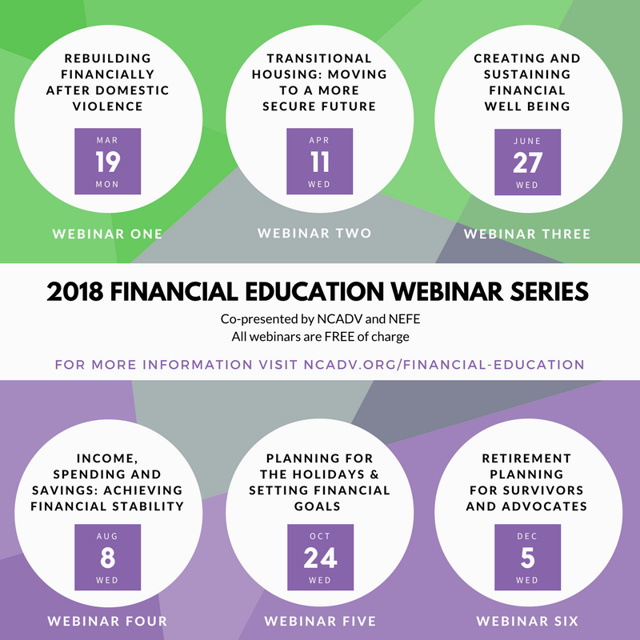 Co-presented by NCADV and the National Endowment for Financial Education (NEFE), we are excited to share a series of six sequential webinars on financial education for survivors of domestic violence and the advocates who serve them. The series is offered as a full curriculum, or webinars can be chosen a la carte for those seeking to increase their skill set on a specific topic. Each 90-minute webinar provides essential financial literacy skills: from basic money management skills, budgeting and setting financial goals to planning for retirement. Victims of domestic violence often make several attempts to leave an abusive partner and are forced to return for economic reasons. Economic self-sufficiency is frequently the difference between violence and safety for many victims. Domestic violence advocates must be prepared to address many of the economic issues that victims face, and facilitate opportunities for victims to learn how they can improve their economic situation. Issues such as budgeting, identity theft, banking, predatory lending, violence in the workplace, housing, and credit, all play a role in ending domestic violence. NCADV is addressing economic issues through our financial education project. In 2001 we collaborated with the National Endowment for Financial Education and developed financial education materials called, Hope & Power for Your Personal Finances: A Rebuilding Guide Following Domestic Violence, in an ongoing effort to support victims of domestic violence in their endeavors to achieve economic self-sufficiency. In addition to the materials, NCADV provides training and technical assistance to domestic violence programs and other community organizations who wish to address economic issues with victims of domestic violence. The Participant Workbook, Hope & Power for Your Personal Finances: A Rebuilding Guide Following Domestic Violence, was created by NCADV, the National Endowment for Financial Education, and Intuit. It is written to help battered women regain control of their financial lives and begin to build a better future for themselves and their children. It is designed for women who have left an abusive relationship and for those who are still in the relationship and are considering their options. *Please note: these materials may take several minutes to download because of their size. You will need a PDF reader to open them. If you do not have one already, download the free Adobe Reader here. National Endowment for Financial Education: www.nefe.org. 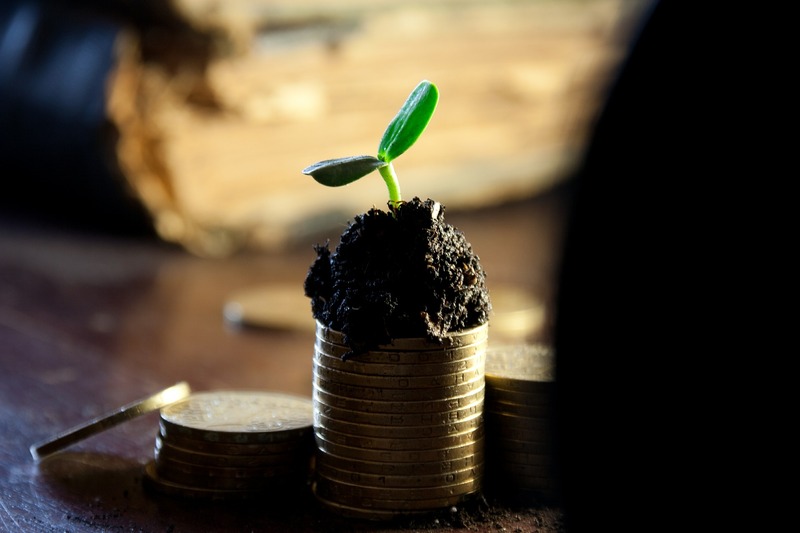 NEFE is a foundation that partners for the financial well-being of the public. They are dedicated to helping all Americans acquire the information and gain the skills necessary to take control of their personal finances. NEFE partners with other concerned organizations to provide financial education to members of the public, in particular, to underserved individuals whose financial education issues are not being addressed by others. To access NEFE’s financial education clearinghouse, click on Multimedia Access and then on the financial education clearinghouse at the top of the page. Women’s Institute for Financial Education: www.wife.org. The Association for Enterprise Opportunity (AEO): www.microenterpriseworks.org. The national membership organization for the microenterprise development field, AEO, works to assist underserved entrepreneurs to start, stabilize and expand businesses. AEO does this by supporting a network of non-profit microenterprise development programs around the country. These programs provide training, technical assistance and financing to help people start and grow businesses. This can be a valuable income generation path for domestic violence survivors. To find a potential partner program near you, go to AEO’s website and look on the home page for the category “Member organizations near you”. You will be able to search by state for program contact information. Created by the Women’s Bureau of the U.S. Department of Labor, Wise-Up targets generation X women, by providing an online financial education curriculum.